You might have seen it and thought it was “just a pile of rocks”. You’re right, it is a pile of rocks, but it is a pile of rocks with a purpose. Also known as rubble, shot rock or rock armour, we use this rock star to protect our coastlines, riverbeds, bridges and steep hills from erosion by water. How does something as unassuming as a pile of rocks have such a big impact on erosion? When used for water erosion, rip rap absorbs and deflects the impact of water before it reaches the important stuff (i.e. bridge or a road). Simply put, when water energy is strong, the rip rap takes a hit for the team, leaving our bridges, roadways and shorelines to serve another day. 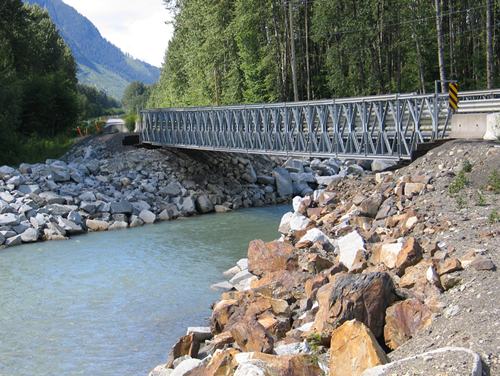 The Peace River Region, which was hit hard by water erosion this year used approximately 40,000 m3 of rip rap to repair highway infrastructure damaged by flooding. If you think that rip rap is just a brute force in erosion control, you are mistaken. Our sturdy friend has an intelligent side too. Gaps in rip rap trap and slow the flow of water, which also slows erosion. Larger rip rap “piles” are used to control large scale erosion and are interlocked to stabilize the pile, allowing it to stay in place for many years to come. Do you know why the shape of the rock used as rip rap is important? Rough cut and angular rock are more effective at breaking down energy than rounded river rock and, while river rock may look nice, irregular rocks bind together more easily. Using large, irregular rocks as rip rap also helps recycle material created during blasting and other road building projects. So the next time you scramble over some rocks to get to the sea, or see small ferns and animals poking their heads out of “a pile of rocks” along the highway, you will know that those are no ordinary rocks; They are rocks that help stop the roll of erosion.